I just can’t help myself. I’m excited about The Force Awakens and about the little party we’re tossing in it’s honor…so much fun…and so many yummies. 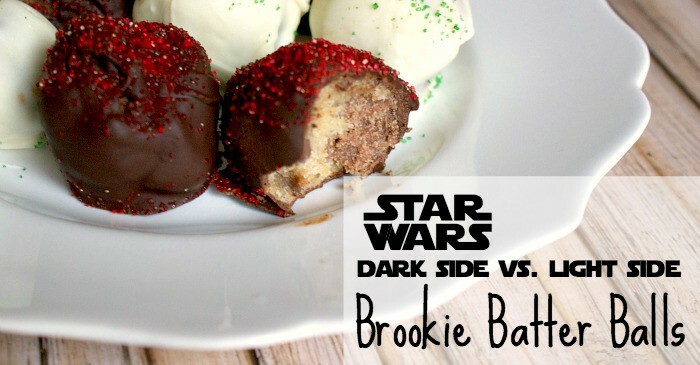 One of my favorite little snacks I made for the Star Wars party is the Dark Side/Light Side Brookie Batter Balls I made. Easy mixture of brownie batter, cookie dough and chocolate, these are just perfect for popping…perfect. If Yoda drops-by, we’ve totally got the little white chocolate fix he needs. And if Darth Vader shows up, we’ve got him covered, too. Heh. No doubt, these are so yummy, I could totally eat my weight in them. I’m not joking. And the best part is that I made them totally gluten and dairy-free. So, I can chow down on these knowing there won’t be any unpleasant repercussions later in the evening. My party is awesome like that–not all parties, just mine. Heh. Who knows…maybe Anikin was lactose intolerant. Or even Padme. And you know that stuff runs in families, so that means that Leia might’ve been, or that twin of hers…what was his name? Whatever. Heh. No, for reals, I’m not sure who Rey’s mom and dad are (although I’m crossing my fingers that she’s Leia and Han’s daughter because, you know, THAT WOULD ROCK), but if they’ve passed on the no-dairy gene, she should totally eat my brookie batter balls to keep from being ill later. It’s just a thing. LOL! I’m going to stop being a dork now and move back to being my nerdy self. Check out the recipe. You won’t be displeased. It’s easy and fun–the kids can even get in on it. Get themselves a little dark side action if they’re leaning that way…or just shove them toward the light. That’s all Anikin really needed–a good shove in the right direction…Heh. Sprinkles in red and green because you know, light sabers, duh! Make the cookie dough by combining the dry ingredients in one bowl and the wet in another. Combine wet and dry ingredients in 1/3 increments. Set aside. Make the brownie batter by combining the dry ingredients in one bowl and the wet in another. Combine wet and dry ingredients in 1/3 increments. Microwave the chocolate chips in 30-second increments, stirring between, until chocolate is smooth. Add chocolate to the mixture and stir until thoroughly combined. Brownie batter should be very dry like dough, not traditional batter. Form a ball using a small amount of cookie dough and an equally sized amount of brownie dough, mushing them together, but not mixing them. Continue making balls like this until all of the dough is used. 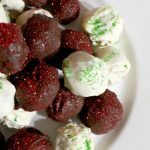 Set balls aside and STOP EATING THEM!!! Don't make me get Vader. To make the coating, place the chocolate in the microwave in 30-second increments, stirring between, until chocolate is smooth. 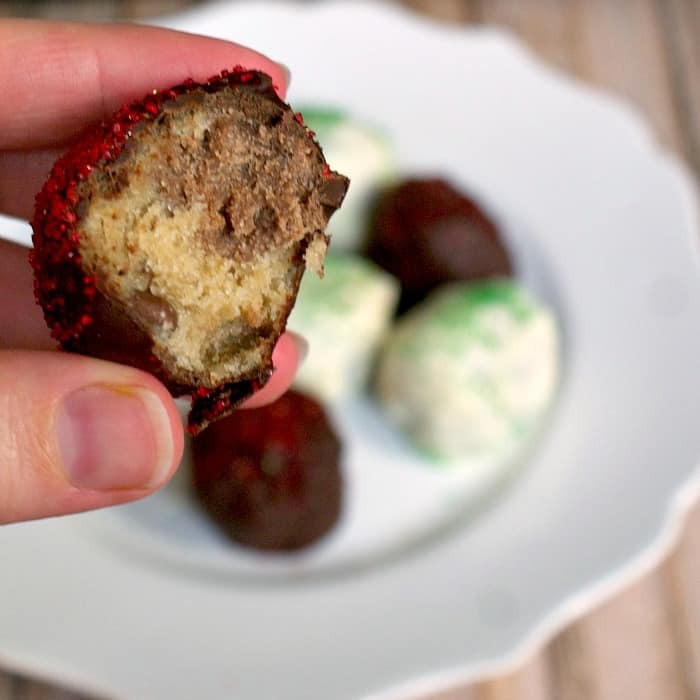 Carefully dip half of the batter balls in the chocolate and coat thoroughly. Immediately drop sprinkles all over. Repeat the coating steps with the white chocolate. 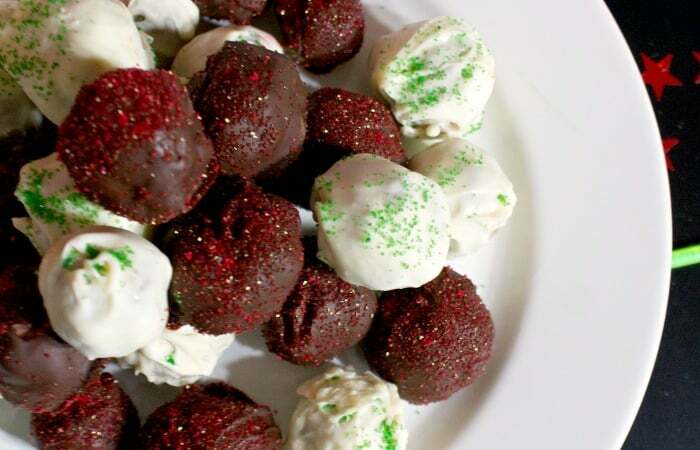 Place balls in the refrigerator for 10 minutes or until chocolate hardens.